At the town of Barisal, on the banks of the Beeghaye River, and elsewhere in the Gangetic Delta, have been heard, sporadically, and without traceable cause, since time immemorial, loud detonations like cannon-shots. The sound is like nothing else in Nature; it is neither a rumbling, a crashing, nor a roaring; hence neither like the sound of thunder, the sea beating upon a strand, the fall of forest trees or buildings, nor the effect of gusts of wind rushing into caverns or through rugged cliffs. They are like gun-fire and nothing else in the world. Like the roar of large ordnance, too, not like the ring of a howitzer or a cannonade. A single "gun" or a series of a half-dozen, more or less, may be heard at Barisal or some other place, on one or more days in a given year, and not again throughout the whole twelvemonth; or they may be heard somewhere else and not there at all that year, though they had been in the previous one, or may be in the one following. Nature does not indulge in such vagaries. The "guns" come sporadically, in all times of the year, never regularly, never so as to be expected. They occur without any regularity, at different seasons of the year, at places widely apart in and about the vast alluvial plain of the Gangetic Delta, and coming from different points of the compass. The Asiatic Society [of Calcutta] issued a circular in 1886, and fifteen forms were filled up and returned to the Secretary. 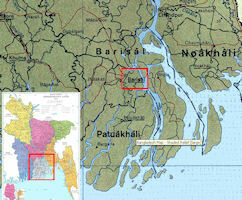 The observations were made at Khulna, Barisal, Moyapore, Narainganj, Noakhali, Harispur and Daulat. None of the reports refer to the same day, nor to the same hours, while the same observer would hear the "guns " at dates considerably apart. These plainly indicate that the "guns" are not waves of sound travelling over wide areas, but heard at isolated places: hence going to discredit the theory that they are due to the beating of surf-rollers upon the beach of the Bay of Bengal. The reports agree as to there having been cloudy or rainy weather at the time the sounds were heard or during the previous twenty-four hours. They seem to be independent of the wind, being heard as well against as with it. A variety of puzzling atmospheric acoustical phenomena are heard in different parts of the world, some like the Barisal Gun, others quite different. It is well known that this mysterious booming is not peculiar to Barisal, but has been noted in Cochin China and in certain islands in the West Indies. There seems, however, to be some difference in the sound heard, some authorities stating that it seems to proceed from a thousand Aeolian harps, others that the noise was like that of the bursting of a huge bladder or like the booming of guns at sea, and in some cases it was compared to a humming similar to that which a locomotive sometimes makes when blowing off steam. Of course, the interesting fact in all these observations is that the cause of the acoustic phenomenon is always a mystery; it cannot be traced to known physical causes. Various theories have been propounded from time to time to account for the phenomenon commonly known as the 'Barisal Guns', but none of them can be said to offer a satisfactory explanation. Five theories have been offered to account for them: A viz., I. Surfbeating upon the shore (sixty-five miles away as the crow flies). II. The breaking down of river banks (of alluvial soil, free from rocks, and only a few feet in height). III. The firing of bombs by natives (a childishly weak theory in view of the facts). IV. Subterranean or sub-aqueous volcanic or seismic agencies such as the escape of steam puffs from submarine volcanoes (a theory at variance with all the geographical features of the Delta). V. Atmospheric electricity (a theory based upon no observed facts and no recognized laws of electrical action - they are heard the best in the clearest, driest weather, and never during storms [some sources claim they are only heard during heavy rains], so atmospheric electricity cannot reasonably be considered the cause). Scientists through their speculative flounderings and showing their failure to come to any better hypothesis than the "superstitious" one of the "ignorant natives", viz., that the Barisal Gun is a phenomenon connected with the agency of elemental spirits (devatas). They think they have a supernatural origin, and they give two explanations: one, that they are the sounds of the opening and shutting of the brazen gates of the mythical palace of Ravanna, on the island of Ceylon; the other, that aerial beings were firing ghostly cannon in honor of some great man who was ruler hundreds of years ago. It is as valid a case for speculation as either of the others. Reports of strange sounds seem to be very much rarer now, in these noisy times. J. B. Calvert suggested that "the Barisal guns, and similar phenomena, are the sounds of thunder carried by anomalous propagation over several hundred kilometers to the points where they are heard. In many cases, the sound is described as much like thunder, and to come from the direction of the horizon, with no apparent source, and often in multiple, all of which is characteristic of noises heard by anomalous propagation."